Heavy vehicle drivers are often required to work for long hours and are therefore susceptible to fatigue. The guidelines recognise that managing heavy vehicle fatigue is a shared responsibility between road managers, heavy vehicle drivers and operators, and clients. Road managers are responsible for providing HVRAs which can help drivers manage fatigue and comply with driving hours regulations, by providing an opportunity for sleep and rest breaks. 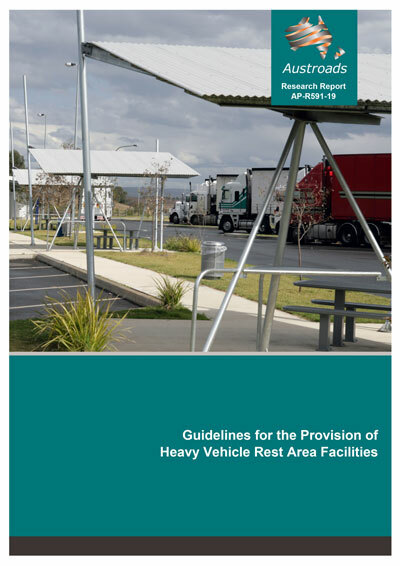 These Guidelines are intended to assist with this aspect by helping road managers plan for an environment which supports heavy vehicle drivers to rest before they re-commence driving. Heavy vehicle drivers and operators also need to plan journeys in accordance with heavy vehicle fatigue management regulations. This includes consideration of available HVRAs and the facilities they provide and then planning their rest accordingly. Clients also need to pay fair and reasonable prices to transport goods, recognising their position in the chain of responsibility and the effect that unrealistic delivery deadlines can have on fatigue and compliance with the law. Application of the Guidelines by road managers will assist the freight industry to support safe heavy vehicle operations while meeting their requirements within the prescribed heavy vehicle driving hours regulatory framework. The Guidelines draw on and provide an update to the 2005 National Transport Commission Guidelines. They also incorporate guidance outlined in ‘A Proposed HVRA Needs and Prioritisation Methodology’, published by Austroads in 2012. Join us for a free webinar on Thursday 14 February 2019, 1pm AEDT for an overview of this study by report author David Green, and Mandi Mees. No charge but registration essential. Can’t make the live session? Register and we’ll send you a link to the recording. Register now!